The Yorkshire Post has published a lovely article on the Swartland. With focus on last year's revolution - and particularly the tasting by Stephane Ogier of the Northern Rhone - Christine Austin tells the story of a wine region that is fast becoming world class. 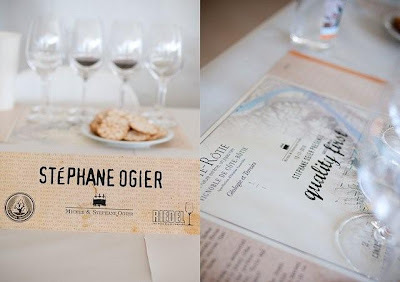 "The reason for Stéphane’s presence in South Africa that day is because Swartland shares many of the characteristics that create some of the Rhône’s finest wines. The soil is complex with granite, clay, slate and river shale creating individual pockets for different varieties; the climate is hot during the day but a cooling breeze spreads over the region in the afternoon; and there is enough distance between the Swartland and the manicured vineyards of Stellenbosch to feel that this is the pioneering, Wild West of wine growing." She also focusses on Eben and Adi's journeys to the Swartland and rates some of their wines, including the "fresh-tasting complex, pepper and aniseed Badenhorst Family Red 2007, which is on its way to becoming one of South Africa’s great wines" and Eben's "dark, chocolate and spice-driven Syrah-Mourvèdre blend, Columella which is consistently rated as one of South Africa’s top wines."